Heya! 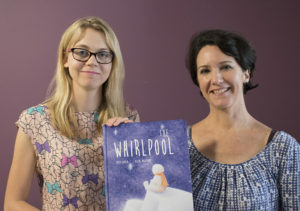 I’m excited to announce that my illustrated book The Whirlpool was published on May 1, 2017, with Wombat Books. The Whirlpool traces a polar bear cub’s journey through the highs and lows of life, and depicts how his perspective is coloured by emotion. The narrative uses symbolic language and imagery to reflect that despair may be followed by the return of hope, and Helene Magisson’s beautiful illustrations are sure to appeal to children and adults. I’ve loved working with Rochelle Manners and Emily Lighezzolo from the Wombat team to bring my story to the world, and Helene Magisson’s illustrations are spellbinding. If you would like to check out the Wombat Books website, here is the link: www.wombatbooks.com.au. Or, if you’d like to see some of Helene Magisson’s work, here is the link for her website: www.helenemagisson.com. Hope you enjoy The Whirlpool!